This log pressure versus log volume phase diagram illustrates phase behavior of a single component (water) and the concept of state functions. Use sliders to move the black dot at constant pressure or constant volume. The piston-cylinder represents the volumes of liquid and vapor present, use buttons to view the volumes on a log or linear scale. 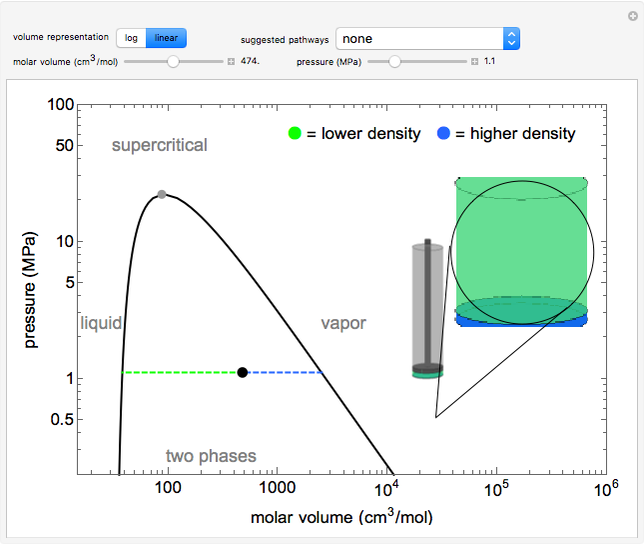 When two phases are present and the linear scale is selected, a pop-out shows a magnified view of the liquid and vapor volumes. Liquid in the cylinder is blue and vapor is green, and the intensities of these colors increase as their densities increase. Note that the single-phase liquid, vapor, and supercritical regions are labeled, but no boundaries exist between them.T he critical point, which is the highest temperature and pressure where two phases coexist, is at 647 K and 22.1 MPa for water. 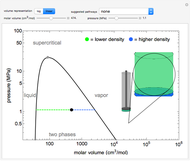 Use this diagram to illustrate circumnavigating the critical point by moving the black dot from the liquid phase to the supercritical region and then to the vapor phase without a phase change (i.e., without two phases coexisting). By contrast, observe two phases in equilibrium by moving the dot from a small to large volume below the critical pressure. where is pressure (MPa), is the ideal gas constant ( ), is temperature (K), is the molar volume ( ), and are Peng–Robinson constants, is the critical pressure (MPa), is the critical temperature (K), and is the acentric factor. 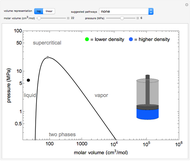 A screencast video that shows how to use this Demonstration is available at . Phase Behavior on a Pressure-Volume Diagram. 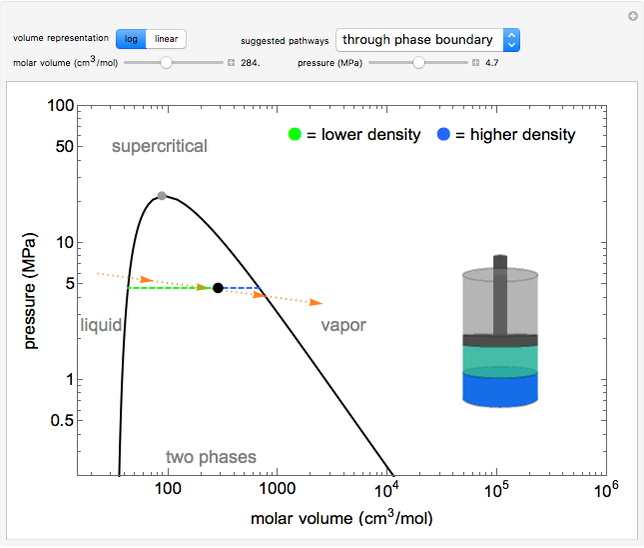 www.colorado.edu/learncheme/thermodynamics/PhaseBehaviorPVDiagram.html. Rachael L. Baumann "Phase Behavior on a Pressure-Volume Diagram"